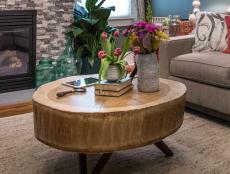 We turned an old six-pane, wood door into a one-of-kind, two tiered coffee table. 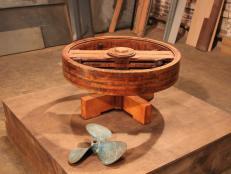 This is great project for an intermediate woodworker. The total cost was about $150. 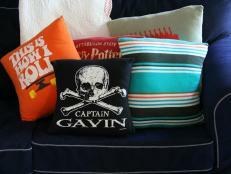 One of the most interesting aspects of upcycled furniture is that each piece is a one-of-a-kind. 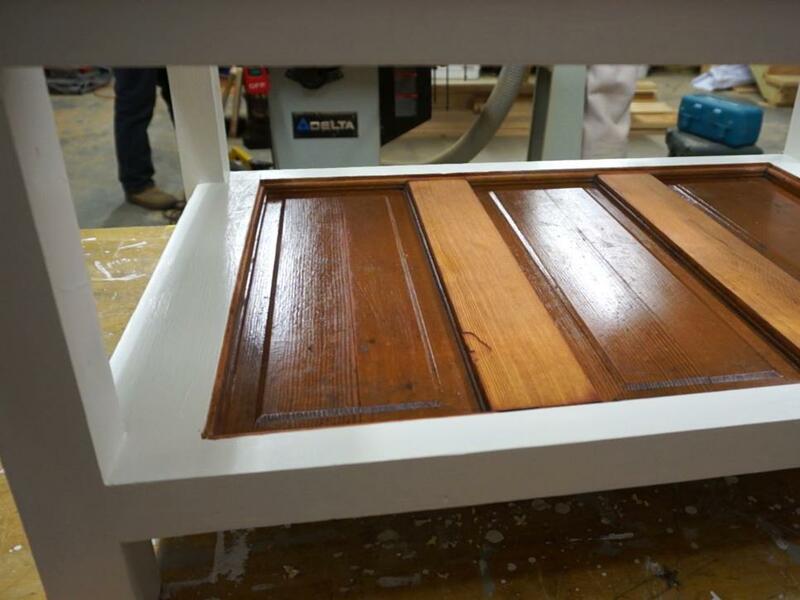 It took about 12 hours total to convert this old door into a table. 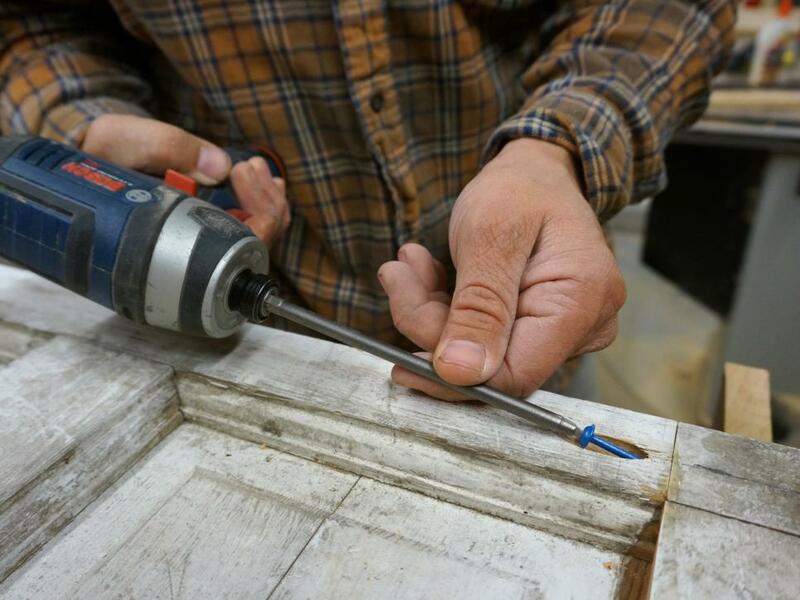 Here’s a list of the tools and materials needed to get the job done: (1) 3' x 6'8" solid wood door; (2) pieces 1/4" sanded edge glass; 8' of 2" x 2" wood square stock; (1) scrap 2x4 or similar; wood glue; construction adhesive; biscuit joiner and biscuits; pocket-hole jig and screws; 3" wood screws; 2-1/2" 15-gauge finish nailer; primer/paint and paintbrushes; table or circular saw; tape measure; square; drill/impact driver; orbital sander; 36" bar clamps; jigsaw with a 2" hole saw; and a router with a 1/4" round over bit and a 1/2" straight bit. 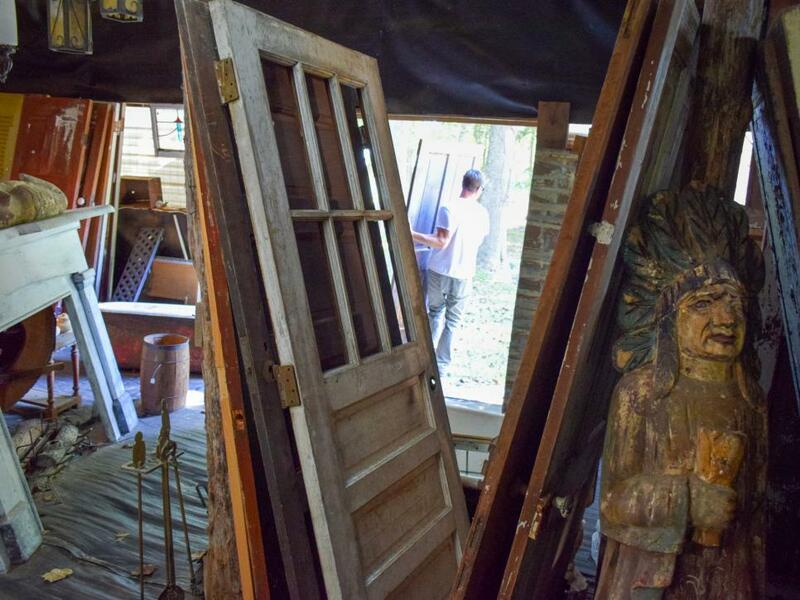 In scouring our local antique barns, we found this six-lite solid wood door. 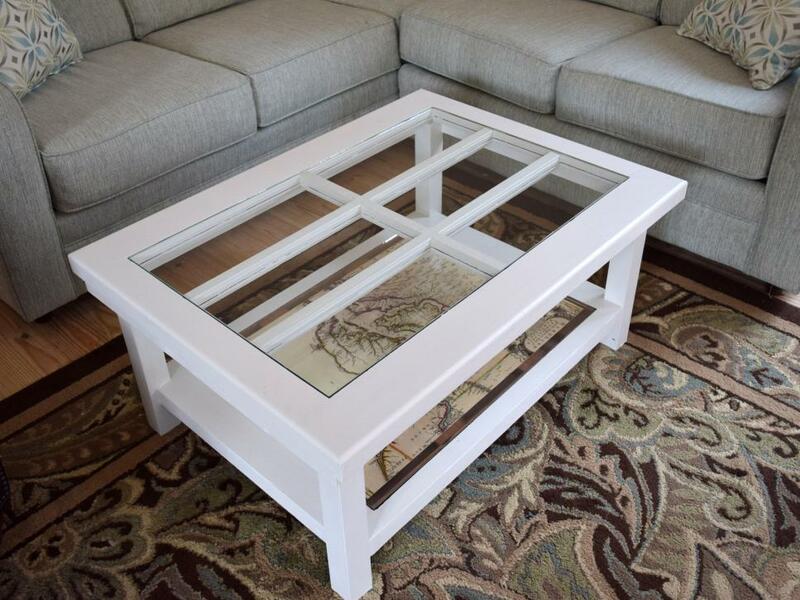 In eying it up, we kept coming back to the fact that since the individual glass lites were busted out, a new solid piece of glass covering all six openings would make an awesome coffee table top. 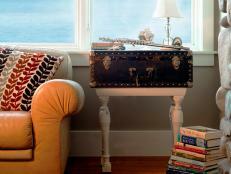 We wanted the three-panel base as the lower shelf of the table since it would be seen through the glass. Because the glass section was shorter than the solid portion, some resizing would be required. 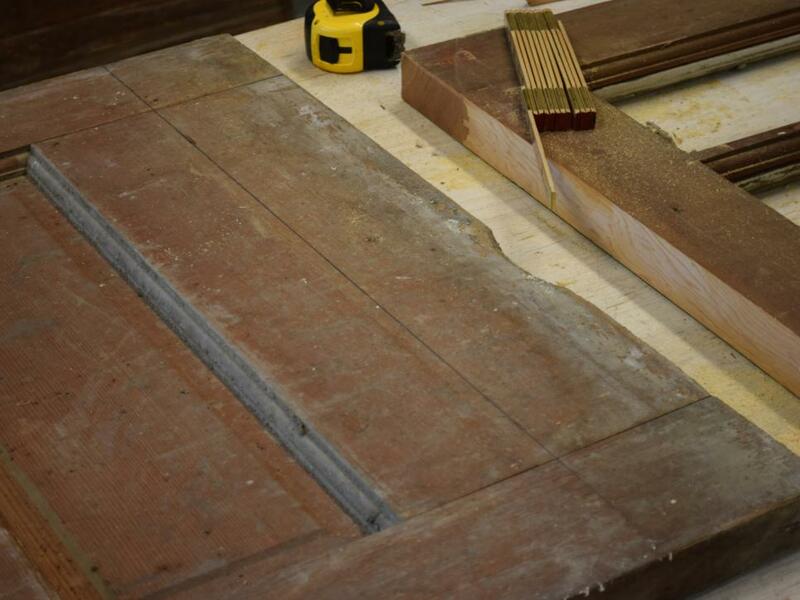 To properly plan this coffee table, we had to measure the door in every direction and along each of the outer rails. Because we only have one chance to cut this piece, we spent the time to consider all options for the final layout. 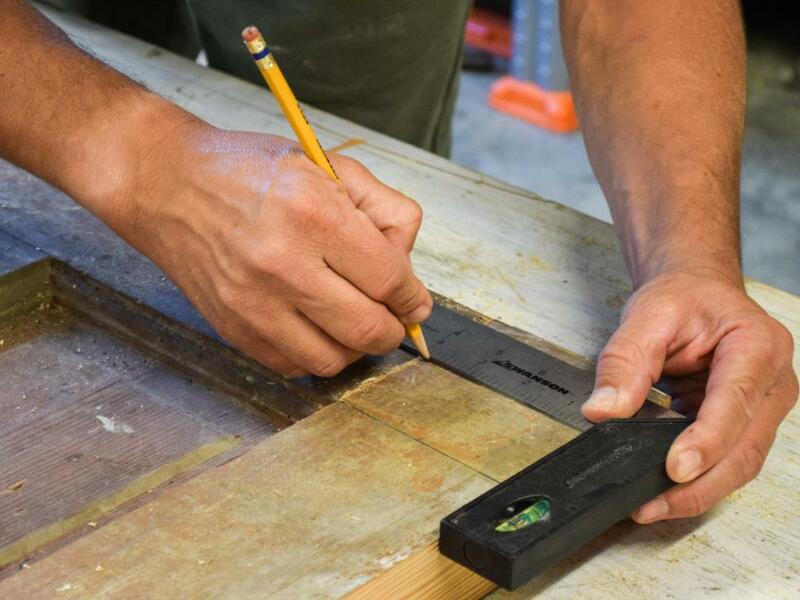 In taking on a project like this, keep in mind whether you want to remove edge imperfections such as hinge and strike-plate locations as this will factor into the cuts needed to keep the top and bottom shelves symmetric. 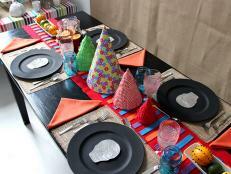 Instead of having the new glass top sitting on top of the entire table, we decided to give it a new spin. We cut down the lite dividers by 1/4" using a router so the new glass will sit flush with the tabletop and cover only the original six lites. The door’s original edges are not square and straight. 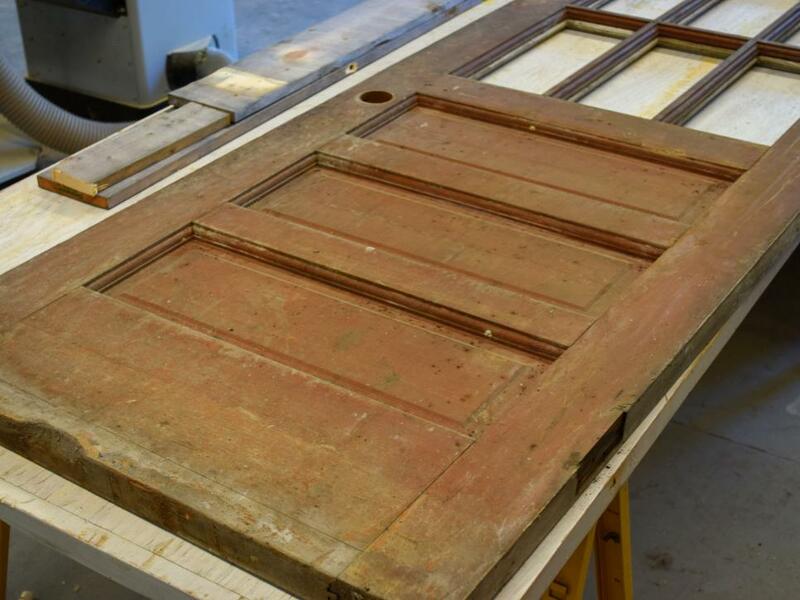 Most older doors will have dragged the floor and been undercut over their lifetime. Also, we need to balance the rails (horizontal pieces) all the way around the glass. 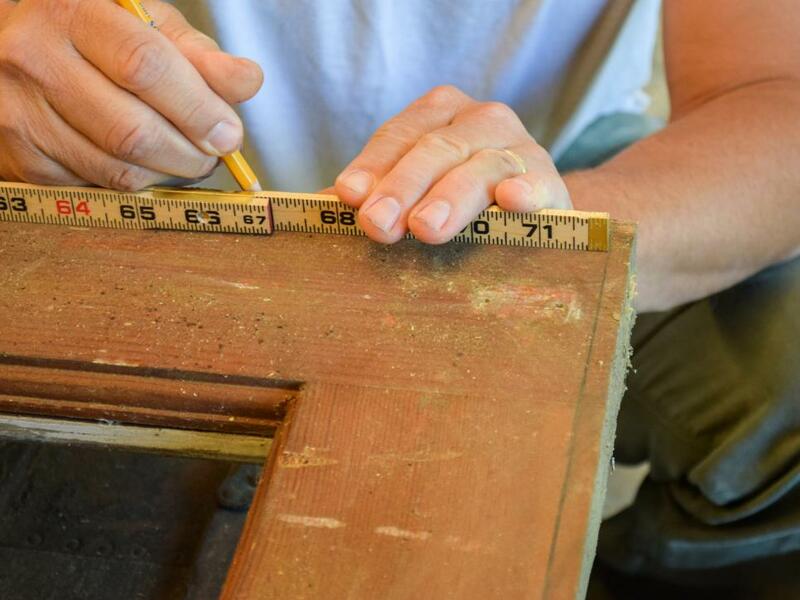 The center cut between the top and bottom panel was determining the rail width, the top rail of the door was marked to match the lower width. 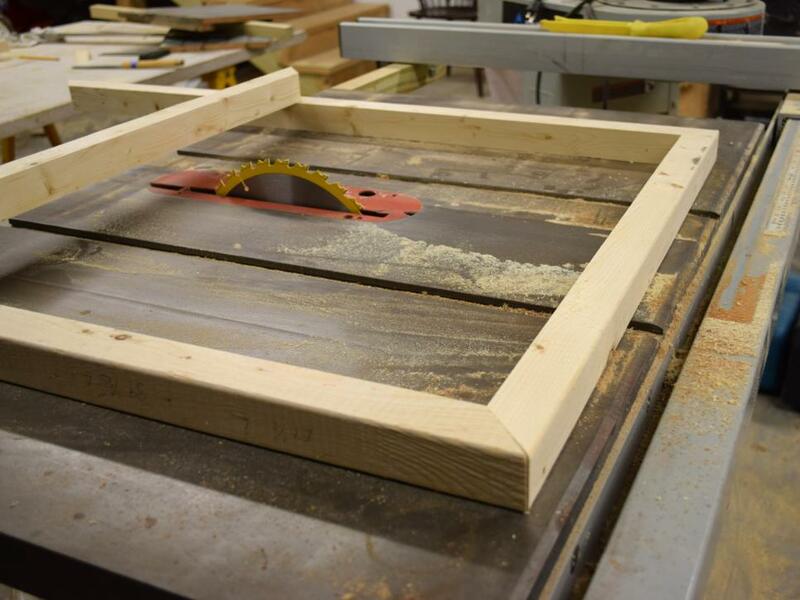 This piece was too big for our standard table saw, so a circular saw was used instead. Mark a second line that corresponds with the distance from the blade to the edge of the plate. Clamp a fence on the second line and use a circular saw to trim the outer portion of the rail off. When we split the door in two, the middle rail (section between the glass and the panels) went with the top. 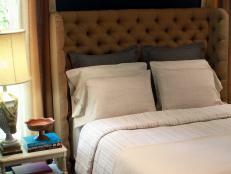 This left the bottom paneled piece uneven without a border rail. So we cut the bottom down and will refasten it to the top. 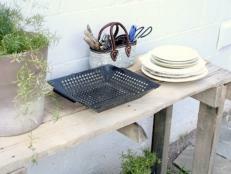 When working with reclaimed materials save every piece as you may need it later. The bottom of the door had a damaged area. 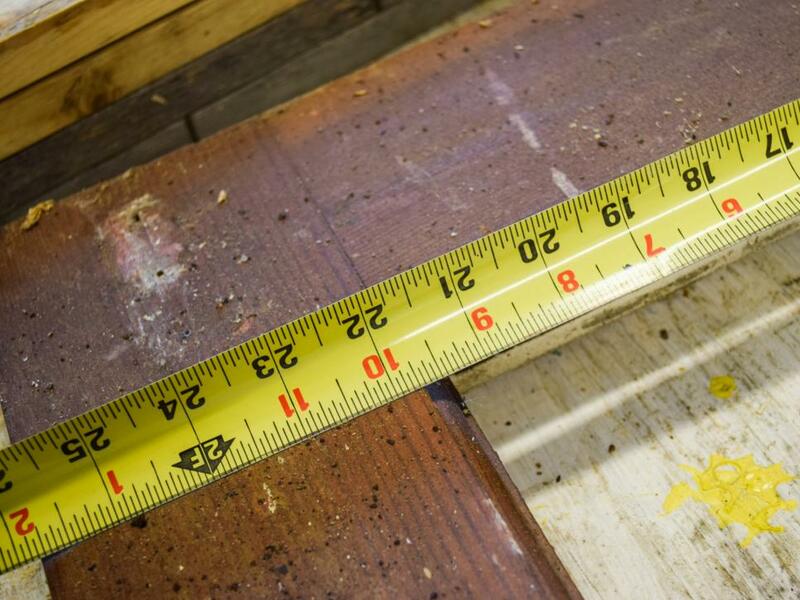 The usable portion was measured and split into equal widths with a circular saw. 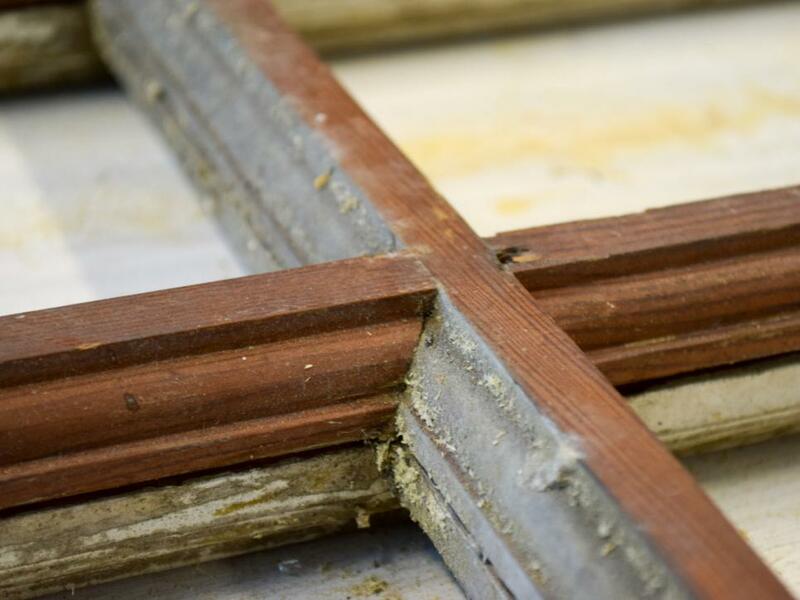 Because the panel trim pieces were saved from the top cut, we could perfectly rebuild this edge. 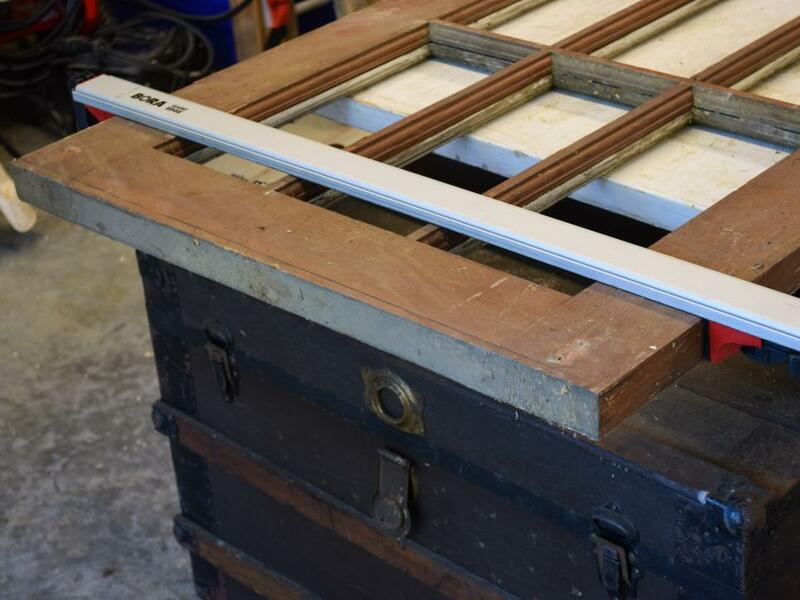 Mark the lower panel and the new rail for wood biscuit locations. Mark the center of the side rail and across the new bottom rail to make sure the cuts will line up. One of the things we liked about this door was that it was so beefy and would have a solid presence as a table. 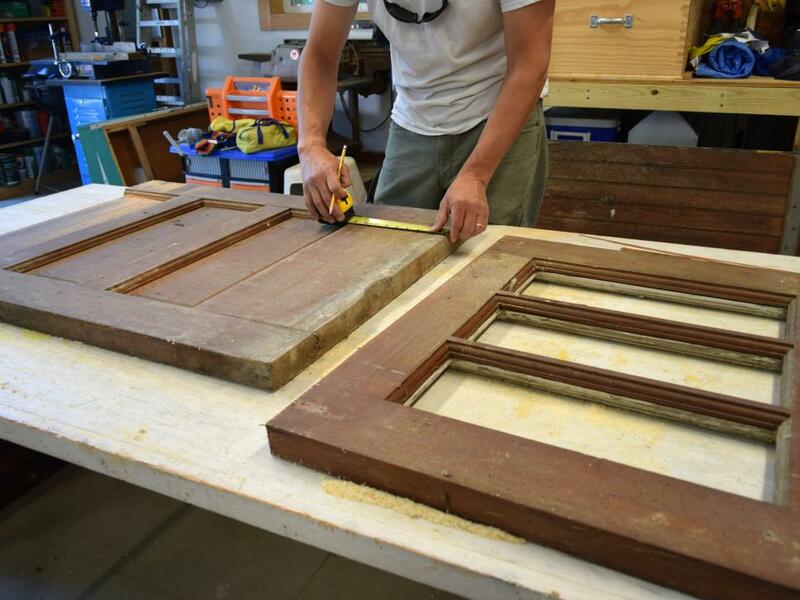 Since the door was 1-3/4" thick, (as opposed to the standard 1-3/8" residential door) we could join these pieces with two wood biscuits. 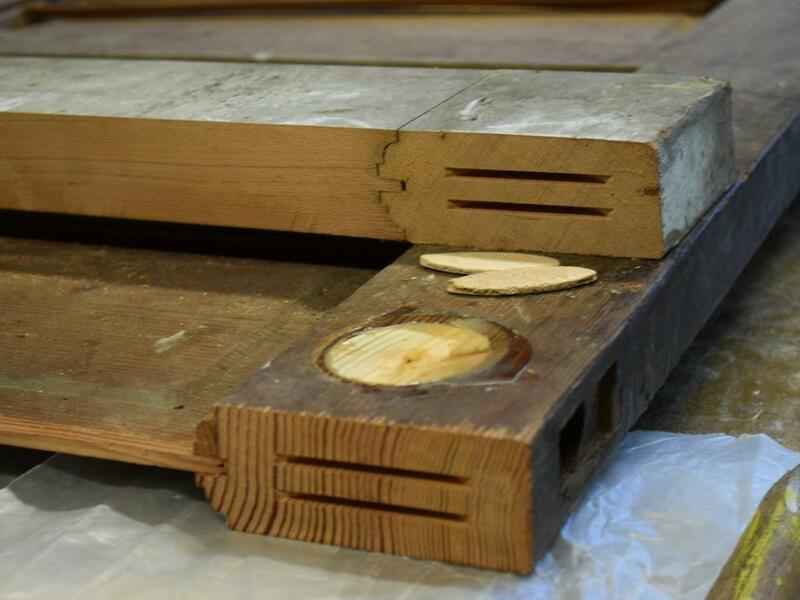 Here you can see the slots cut to hold the biscuits on new horizontal rail and the existing veritcal rail. Once mended, this fix would be unnoticeable. We also took this opportunity to fill the door handle hole with a 2" wood plug and construction adhesive. Because we did not have a 2" plug cutter, we improvised with a 2" hole saw. 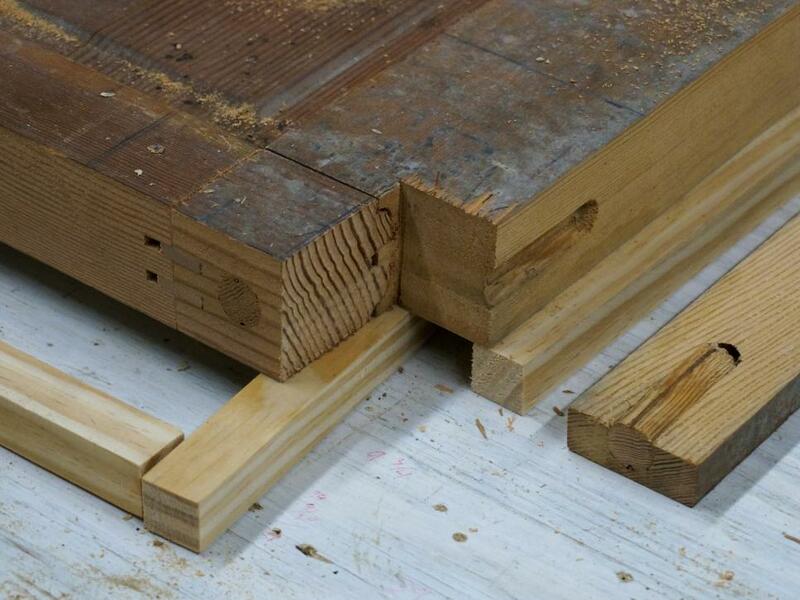 Remove the center guide bit from the hole saw and drill very slowly through any scrap wood of the same thickness. Apply wood glue to the face of both pieces and the slots for the biscuits. 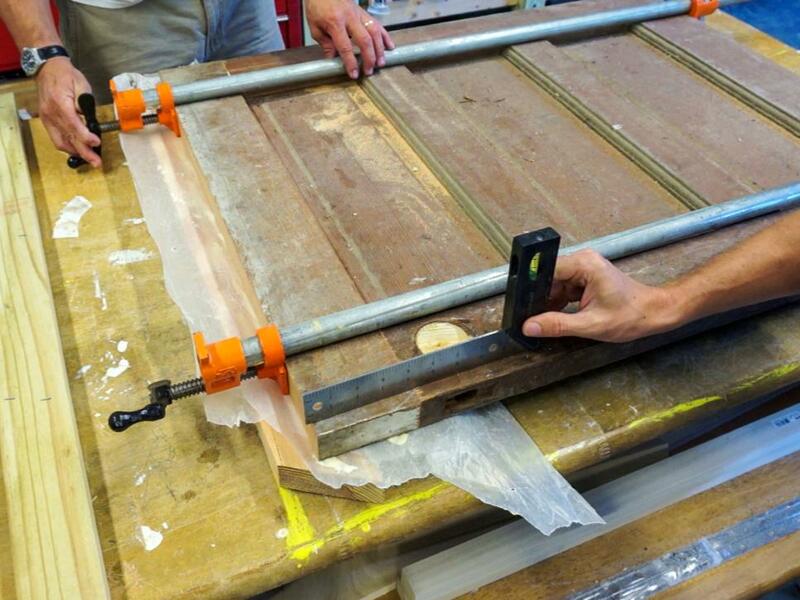 Assemble everything and clamp with two bar or pipe clamps then allow it to dry for 24 hours. To help secure the legs and to give the top the right proportions, a spare 2x4 was cut into 1-1/2" x 1-1/2" strips for a skirt. Mark a 1" offset around the entire underside perimeter of the top and measure for the total out-to-out length of the four skirt pieces. 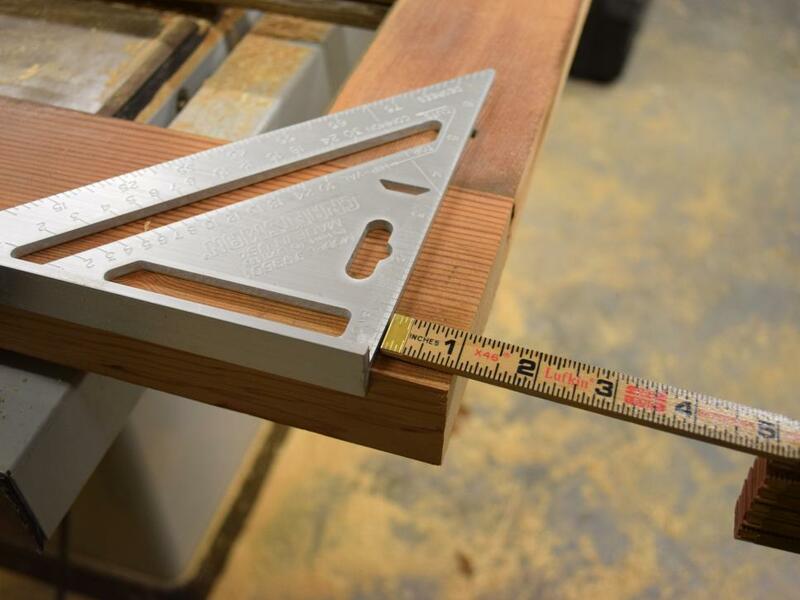 Cut these on a compound or miter saw with a 45-degree angle at each end. 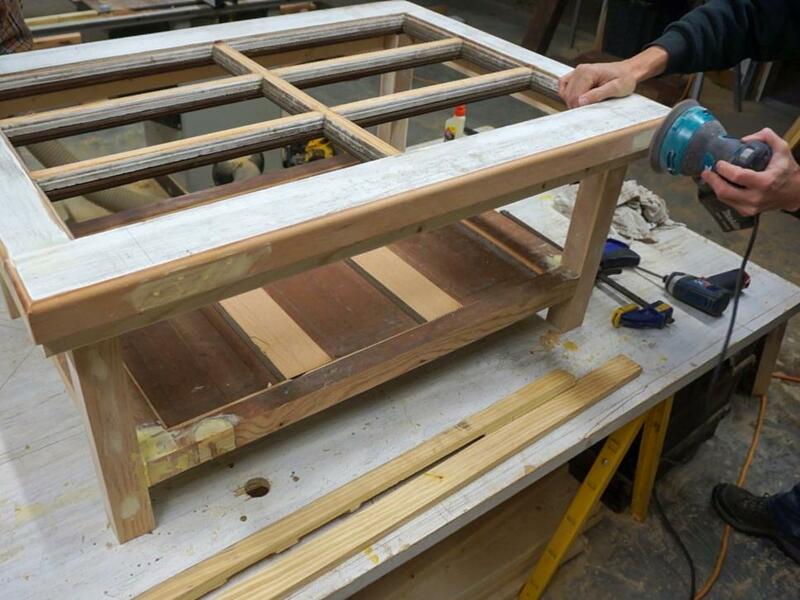 To secure the skirt to the tabletop, drill pocket holes, three in each of the long pieces and two in the short pieces. Attach the skirt with 2" pocket screws and construction adhesive along the bottom and in the corners. 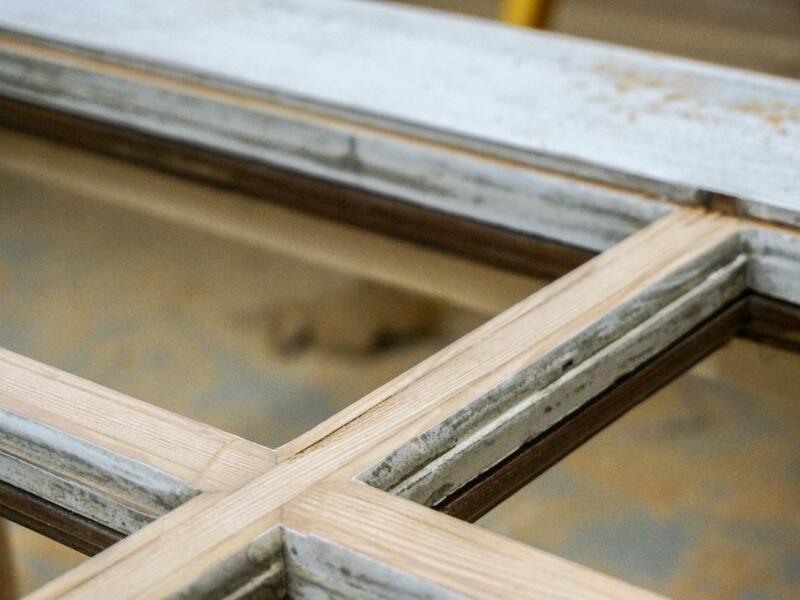 Cut four pieces of 2" square stock to 18" and mount in each corner with construction adhesive and two opposing 3" wood screws. 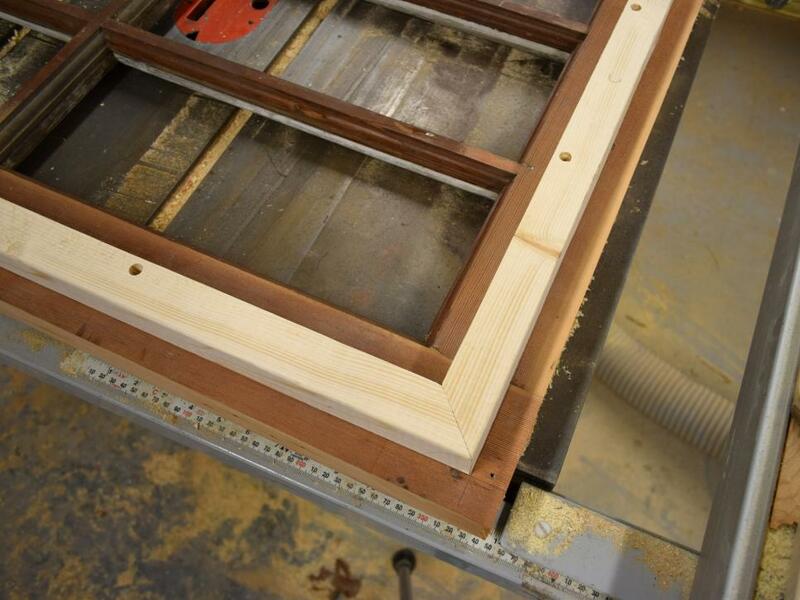 Use a router to cut down the window lite dividers by 1/4". 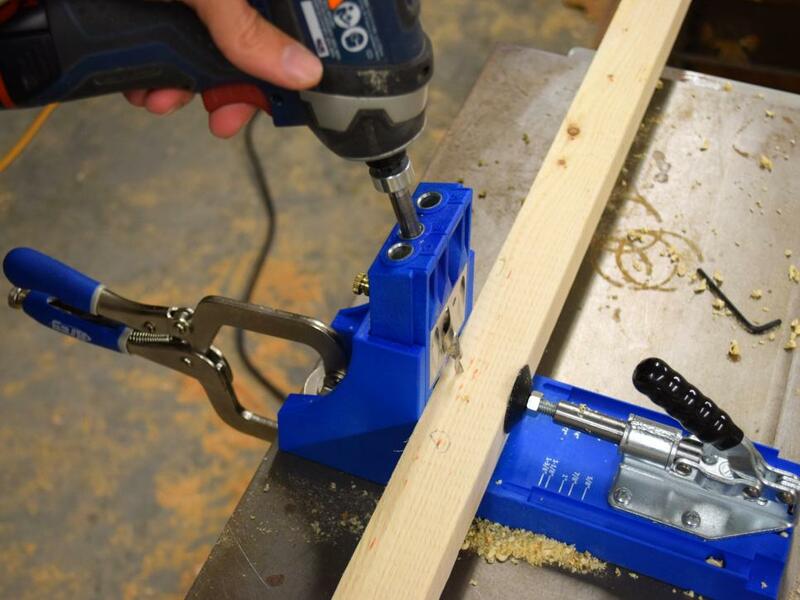 When using a hand-held router, you will have to get creative for smooth consistent cuts. We used two pieces of 3/4" plywood to bridge the top and dropped the bit to be 1/4" below the plywood. Take your time and go slow as this part will be seen in the finished table. 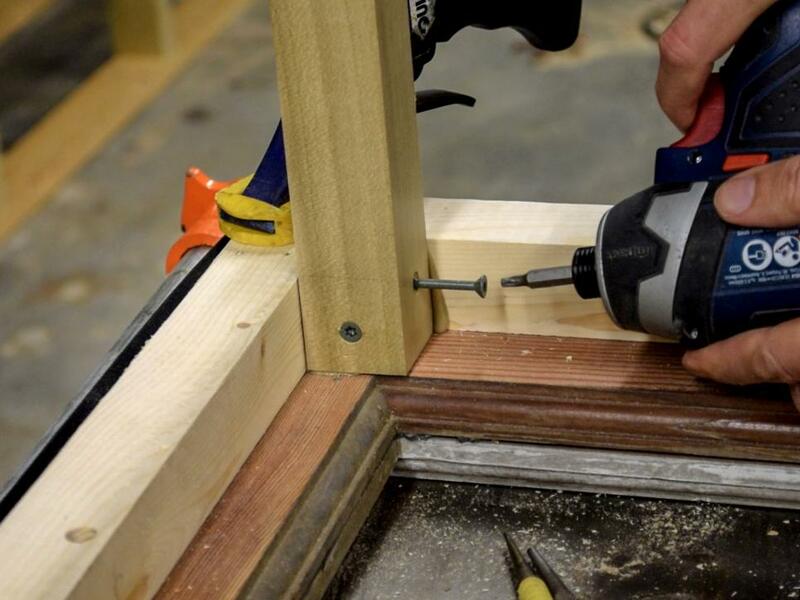 Soften the edges of the tabletop by using the router and a 1/4" round-over bit. 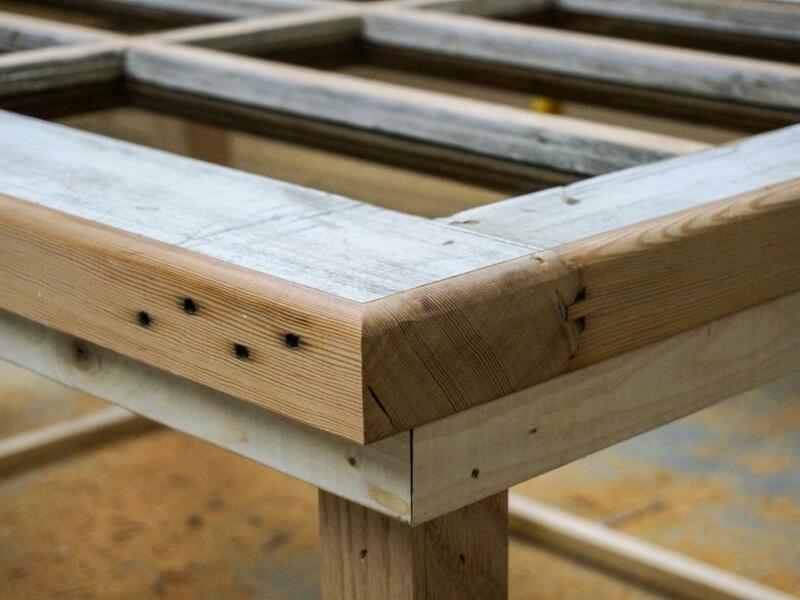 The best way to mark the leg notches in the lower shelf is to use the assembled portion of the table itself. We cut some pieces of square stock to length to make sure the still drying legs stayed in square. 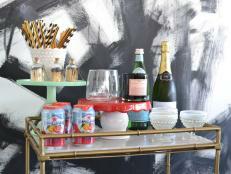 Transfer the marks on the bottom shelf with a pencil and a square. 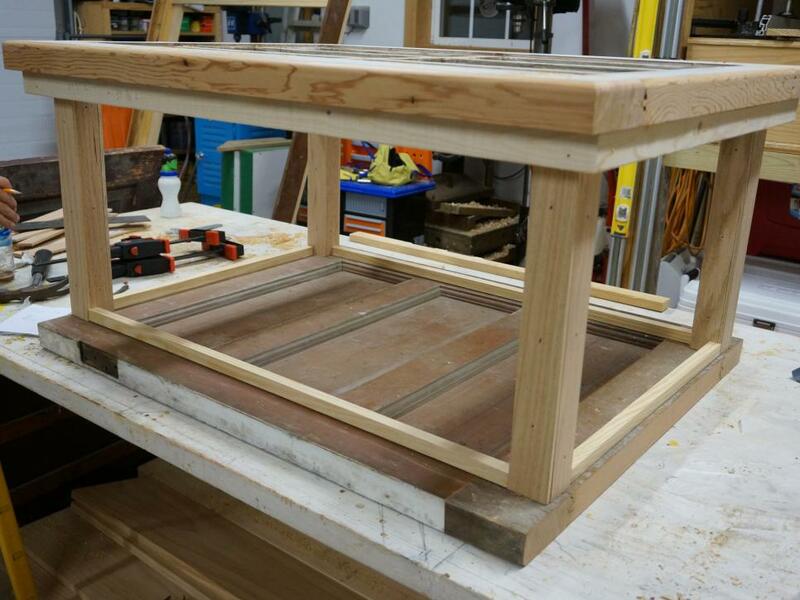 Flip the assembled top over and use two spare pieces of 1x and clamps to hold the bottom shelf up while you attach the shelf to the leg. 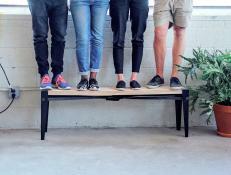 The shelf should sit about 4" from the bottom of the legs. 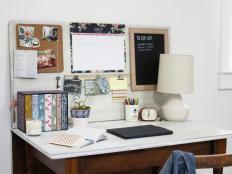 Because the bottom will not be seen, use eight 2-1/2" pocket screws to secure it from the underside of the shelf. 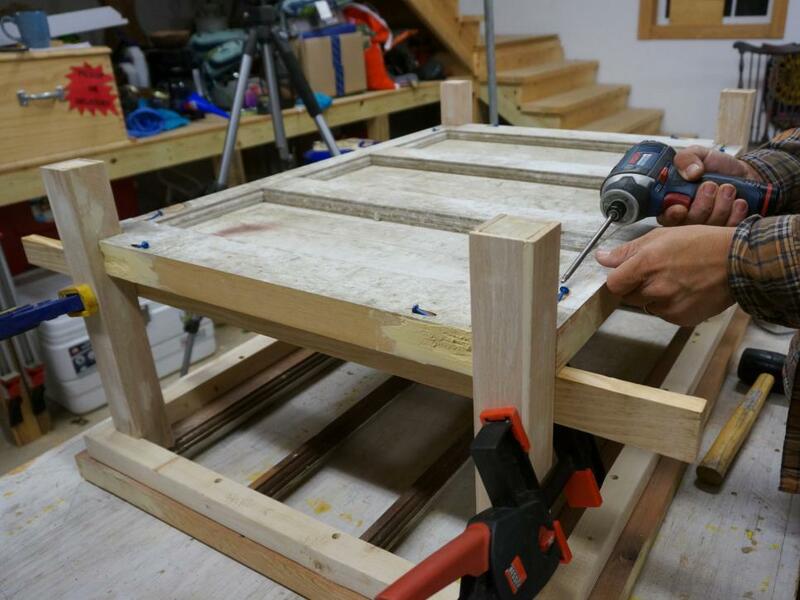 Putty nail holes and gaps and then sand the assembled table. Clean off the sanded residue then prime and paint it. 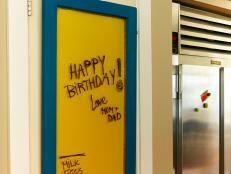 Our original plan was to leave the panels of the bottom shelf unpainted to honor the original door. 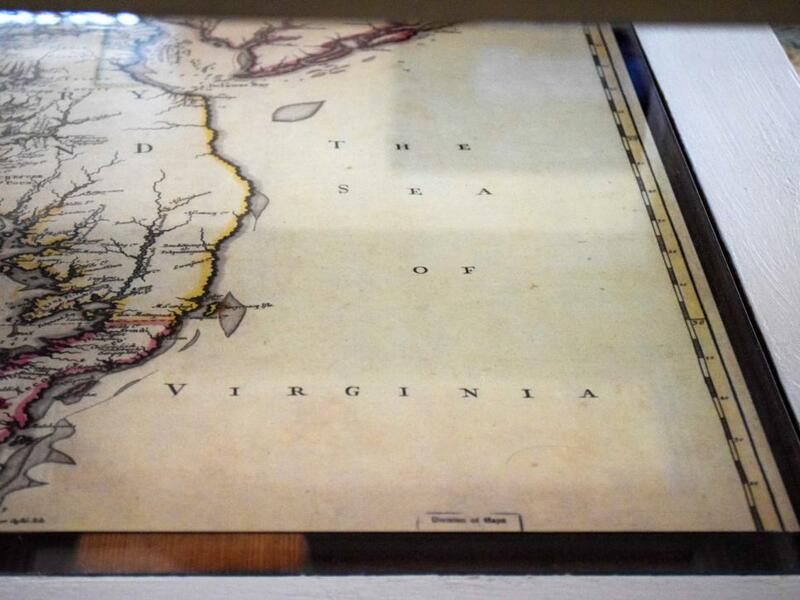 However, the owner found a reprint of an 1800s map of the coast. Being almost the perfect size for the bottom shelf, we came up with a Plan B. We suspended the map on a piece of clear acrylic and then placed piece of 1/4" glass over it. This way the map appears to float above the original wood panels below. 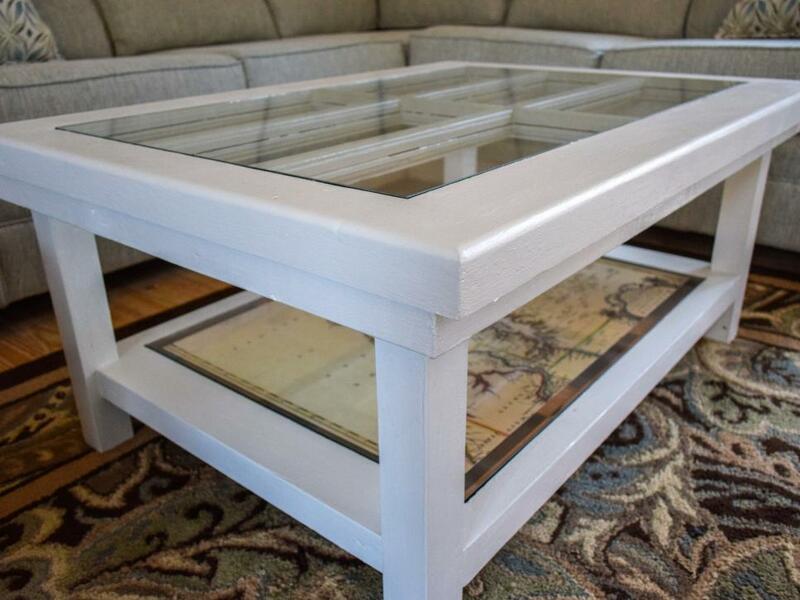 This upcycled coffee table took some careful planning but the outcome was well worth the effort. Built mostly from one old reclaimed door, it features a combination of traditional and modern construction techniques. The map on the bottom shelf is removable, so we can replace it with other artwork, family photos or just leave it as is.